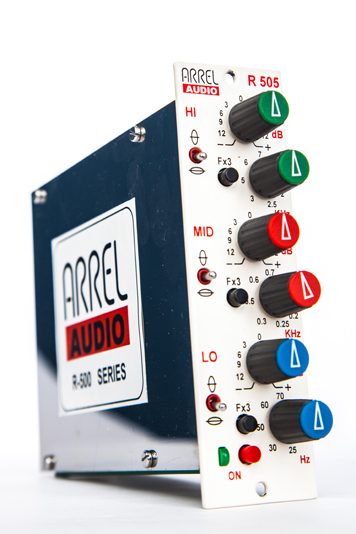 R-505 is an advanced single-channel parametric equalizer conceived to offer to the API 500 user the superior audio performance of the ARREL Audio high level series products. The unit offers to the 500 user high reliability, rugged design, outstanding audio quality, versatility and ease of use typical of the tradition of ARREL Audio products. The R-505 equalizer is based on the Livio Agentini’ s "Single-Stage Parallel Configuration" patented design. This innovative phase coherent EQ design offers the lowest distortion/noise specifications, not available in other products. The R-505 filtering section offers three band LO, MID, HI controls (bell shape). The emphasis/de-emphasis control range is +/-14 dB, the three primary bands become six by using three central frequency buttons (F x 3). The Q control value (narrow, mid, wide) is selected by three switches (one for each band). 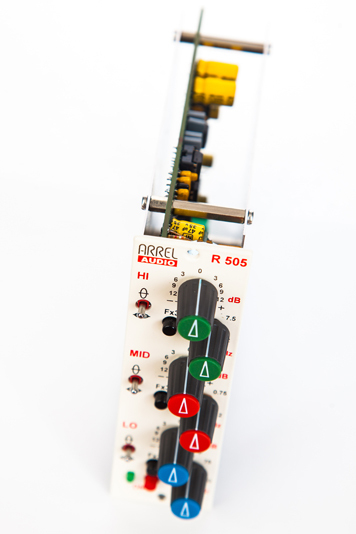 R-505 is the one of of the serie of equalizer that ARREL Audio conceived for the 500 series (the other models are R-502, R-503, R-504) in order to give to the user the best choice for its application. R-505 is dedicated (due to his absolute sonic level quality) to high professional vocal recordings, classical instruments, high dynamic range instruments such as drums and percussions. HI:	Bell shape 2.000/7.000 Hz (F x 1), 6.000/21.000 Hz (Fx2).